Attendees will be able to learn the fundamental aspects of AM and 3D printing. Added Scientific, a technology consulting firm, plans to run a series of additive manufacturing training sessions in the autumn of 2017 for the public. 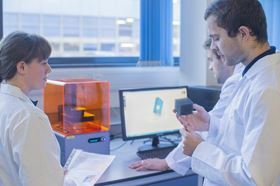 The founders of Added Scientific are also the academic team behind the Centre for Additive Manufacturing at the University of Nottingham and are reportedly continuing professional development (CPD) registered training providers. Future developments in additive manufacturing (1 day). Attendees will be able to learn the fundamental aspects of AM and 3D printing to enable them to understand the benefits and the limitations of the technologies. More information on training courses can be found on the Added Scientific website. This story is reprinted from material from Added Scientific?, with editorial changes made by Materials Today. The views expressed in this article do not necessarily represent those of Elsevier. Two companies plan to join forces to provide additive manufacturing (AM) training to end users.